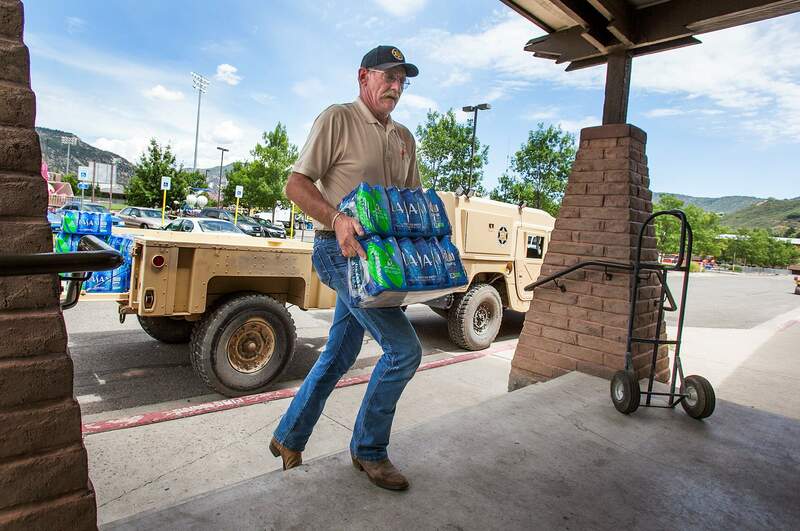 Jim Bryce with the La Plata County Mounted Patrol stockpiles water at the La Plata County Fairgrounds in Durango for use by residents concerned about water quality. Businesses and individuals affected by the Gold King Mine spill will have a one-stop shop for assistance from 10 a.m. to 4 p.m. Tuesday and Wednesday at a Local Recovery Center in the east end of the La Plata County Fairgrounds Exhibit Hall. The economic losses from the Gold King Mine spill into the Animas River are just beginning to be calculated, and they are likely to go much higher before all the ramifications are fully realized. The financial costs may take years or even decades to calculate, which makes filing claims right now with the Environmental Protection Agency a difficult proposition. There are, however, some time constraints to filing with the EPA. The EPA’s Federal Tort Claims Act allows people to amend their claim form at any time before they reach a settlement with the EPA or file a lawsuit under the act, the release said, and anyone claiming injury or damage has two years from the date of the event to file a claim with the EPA under the federal torts act. Meanwhile, what are people supposed to do for current needs such as keeping a roof over their heads and food on the table? The Community Emergency Relief Fund, originally established to help employees affected by the 2008 Main Avenue Fire, has been reactivated by the Durango Business Improvement District and the Community Foundation Serving Southwest Colorado. The fund currently has a balance of $28,000. To get a sense of perspective, in the 2008 fire, about 70 employees were affected, and the fund raised almost $100,000 and distributed almost $80,000, Walsworth said. Money will be made available to employees facing economic hardship directly related to the spill, spokeswoman Indiana Reed said in a news release. “We just want to help people through the first one or two months,” Walsworth said. By working through the Community Foundation for donations, the integrity of the process is assured, Walsworth said, and any contributions made to the fund will be tax-deductible for donors. To determine distribution of funds, BID has created a grant committee, which includes representatives from United Way of Southwest Colorado, the city of Durango, La Plata County Economic Alliance, the Durango Area Tourism Office, La Plata Electric Association and the river-rafting industry. The one-page application will be available by Wednesday. First National Bank of Durango has created the Animas Hardship Loan Program, which is available for both businesses and individuals affected both directly and indirectly by the Animas River spill. The loans will be low-interest with payback periods long enough to allow people time to recover, he said. He also stressed that long-term impacts are still a big unknown. Applications may be made in person at any of First National Bank’s branches. Businesses and individuals affected by the spill will have a one-stop shop at a Local Recovery Center for assistance Tuesday and Wednesday. La Plata County, working with the Colorado Department of Local Affairs and the cooperation of several federal, state and local agencies, will open the center from 10 a.m. to 4 p.m. both days in the east end of the La Plata County Fairgrounds Exhibit Hall. Services will be directed to businesses, employees and landowners who have been affected by the spill. The EPA will be on hand to assist with Form 95 claims for damage and questions concerning loss of business. EPA scientists and representatives of the Colorado Department of Public Health and Environment will answer questions about water quality. The Small Business Development Center, Region 9 Economic Development District, La Plata County Economic Development Alliance and Durango Chamber of Commerce will provide answers and resources for impacts on businesses. The Colorado State University Extension Service will address agricultural and ditch issues. For employees who lost jobs, the La Plata County Department of Social Services will provide information about local financial and social financial supports while the Colorado Department of Labor and Employment/Unemployment Benefits and Southwest Workforce will show how to apply for unemployment events and support job-seeking efforts. “If you believe that you have suffered an economic loss related to the event, or if you have questions related to water quality, crops or livestock, individuals will be on hand to offer information and/or assistance,” La Plata County official Susan Hakanson said in a news release Saturday. To donate to the Community Emergency Relief Fund, checks should be made payable to Community Foundation – Community Emergency Relief Fund and sent to the foundation at P.O. Box 1673, Durango, CO 81302. Deposits may also be made directly at Bank of the San Juans, and donations via credit card may be made at www.swcommunityfoundation.org. To apply for assistance from the Community Emergency Relief Fund, applications will be available by Wednesday at www.swcommunityfoundation.org or www.downtowndurango.org, or at the Business Improvement District office, 850½ Main Ave., Suite 2. Completed applications should be submitted to the BID. For further information about the fund, contact the BID at 375-5067 or the foundation at 375-5807. Applications for the First National Bank of Durango’s Animas Hardship Loan Program are available on the bank’s website at www.fnbdurango.com or can be taken in person at all of its locations: Main branch, 259 W. Ninth St.; Bodo office, 125 Sawyer Drive; inside Albertsons and Walmart; and in Bayfield at 351 Bayfield Center Drive. Detailed information on the program is also available on the website and at the branches. For more information about the hardship program, call 247-3020. For more information about the Local Recovery Center, call the Call Center at 385-8700 or email susan.hakanson@co.laplata.co.us.